The members of SLPS gathered to celebrate the birth of the Yule King, bringing back the light, Saturday, December 19, 2015. A homemade Yule Log cake, kahlua chocolate made at the Yule crafting Friday, December 18, 2015, adorned the altar. The altar was dressed in seasonal colors, flowers, and ritual items. The take over by the Oak King was acknowledged, who rules from Yule to Midsummer during the waxing light of the Sun as it grows brighter till Midsummer. Poetry was read for Yule and the members danced around the Yule altar, calling back the light to the song “Bring Back the Light” by Gypsy on her album Enchantress. The feastings after included chipotle buckwheat, Gorgonzola ham stuff chicken breasts, and broccoli. 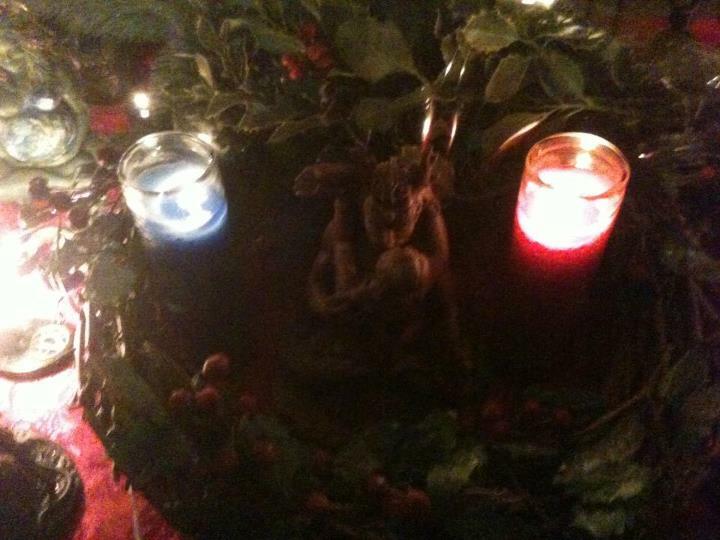 Thanks to all who came and participated in the first Yule celebration and feast by UUPS on Sunday, December 18, 2011. The Yule altar was decorated with lots of tea light candles, votive candles, quarter candles, wreathes, spruce, holly and other seasonal plants. The God and Goddess statue with them in union (below second) was hauled out for use for this holiday as Yule is about the birthing of the God from the Goddess, his mother, queen, consort, wife and lover. After generous praise and preparation, the Goddess went into labor right there in the temple and gave birth to the God. He greeted everyone with a loving arms carrying a message for each person to hear. Gifts, hails, praise and gratitude were given to the God this night as all kneeled in acknowledgement of his divine grace and power. Toasting and praise to other deities ensued before closing. The roars, laughter and praise broke out especially after Baccas invoked with wine! All in all, UUPS had a wonderful time. The feasting was after and everyone ate their fill of holiday delectable! Till we meet again at the Altar of Life! This past Friday December 18, 2009 brought the wonderful opportunity for UUPS to work with its newly formed offshoot group WANDS of Westminster College. A neo shamanic rite was performed by their leader, Christian under snow and full moon! A few members from both groups gathered on the south sound of the college at the amphitheater by a running rive to give honor and praise to father sky and mother earth. The crowning salute came with a drawn sword and refreshments of apple cider. UUPS can’t wait to work again with WANDS! Hail!